With the new age of reporting, society often forgets about those behind the scenes of a story. While newspaper teams are enduring budget cuts and reporters are finding their laps overwhelmed with a variety of different beats, their profession has only become more critical. 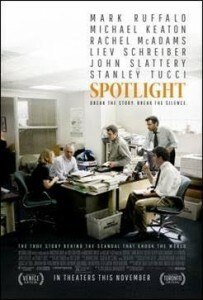 In the bio-drama Spotlight by writer-director Tom McCarthy (The Cobbler, 2015), the Boston Globe’s Pulitzer Prize-winning “Spotlight” team of investigative journalists shocks the world in 2002 after uncovering the Catholic Church’s massive molestation scandal within their local Archdiocese that was perpetrated by more than 70 local priests. Despite taking place in the early 2000s, the film is fairly straightforward and feels fresh, perhaps that’s why it feels so impactful. Even if you’ve been following the news over the last decade, the investigation still builds suspense and instills uneasy tension. The unfortunate storyline mirrors actual reporting in that it starts with something small, but gradually snowballs, gathering new leads and testimonies that meld together into an emotional, controversial and shocking report. Some audiences may find that the information gathering period may drag a bit, but it’s necessary for building the authenticity of the reporting. Again, just like good reporting, McCarthy is successfully able to acknowledge the Globe’s fine work, but doesn’t glorify the reporting team or position them as heroes. They are simply doing their job – telling the story like it is. In the summer of 2001, after recently arriving from Miami, Marty Baron (Liev Schreiber, Pawn Sacrifice, 2014) is promoted to lead editor at the Globe and immediately orders the investigative ‘Spotlight’ team to dig deeper on a short column about a Boston priest accused of sexually abusing young parishioners over a 30 year time span. The team was initially very hesitant because challenging the Catholic Church in Boston would have major repercussions, especially since 53 percent of the Globe’s readership was Catholic. Before long, the four-person team – Spotlight editor, Walter ‘Robby’ Robinson (Michael Keaton, Birdman, 2014), reporters Sacha Pfeiffer (Rachel McAdams, Southpaw, 2015), Michael Rezendes (Mark Ruffalo, Foxcatcher, 2014), and researcher Matt Carroll (Brian d’Arcy James, ‘Law and Order Special Victims Unit,’ 2014) begin unravelling a much larger story than they anticipated. After Rezendes meets with the victims’ attorney Mitchell Garabedian (Stanley Tucci, The Hunger Games: Mockingjay – Part 1, 2014), and the team interviews dozens of adults who were molested as children, it becomes very clear that the Church had a methodical protection plan for the priests that went beyond Boston, beyond the U.S., all the way up to the Vatican. The local discovery exposed similar revelations in more than 200 other cities around the world as well. These suspected priests would conveniently be logged under ‘Sick Leave’ once they were removed or transferred from a church. Just like the small but mighty Spotlight team, McCarthy spent months conducting interviews with journalists, victims and others affected by the scandal to truly depict the story that changed the world. Bottom-Line? Even if you’ve been reading the news over the last 13 years and know the outcome to the Catholic Church’s shocking scandal, you will still find this bio-drama and the stellar cast riveting.